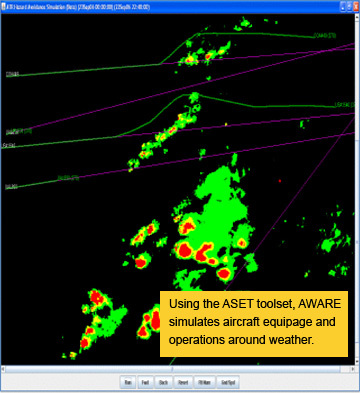 The Advanced Weather Avoidance Requirements Evaluation (AWARE) software allows airlines and avionics manufacturers to quantify costs and benefits of implementing technologies that reduce the impact that severe weather can have on aircraft operations. The 21 July, 2010 turbulence encounter of United Airlines 777, which resulted in over 25 injuries, demonstrates how such encounters affect passengers and crew, the aircraft and flight scheduling. While technologies exist today that increase awareness of these hazards, airlines must justify the cost of implementing new technologies. Factors favorable to implementation are improvements in safety, decreased fuel usage, and the economic benefits of increased efficiency and awareness of weather hazards. AWARE is being developed under a NASA Phase II SBIR and will provide an important tool in making decisions on airborne technology adoption based on safety and economic considerations. • Quantifies costs and benefits of new technologies in cockpit. • Can analyze any combination of weather, traffic, and equipage. • Provides a basis for choice of equipment development strategies for avionics manufacturers and service providers. • Provides business case data on which aircraft operators can base procurements.